Using a powerful new software program called the Scientific Exoplanets Renderer (SER), astronomer Abel Méndez has produced a stunning set of new images — including a global map — showing the distant dwarf planet of Pluto in unprecedented detail. 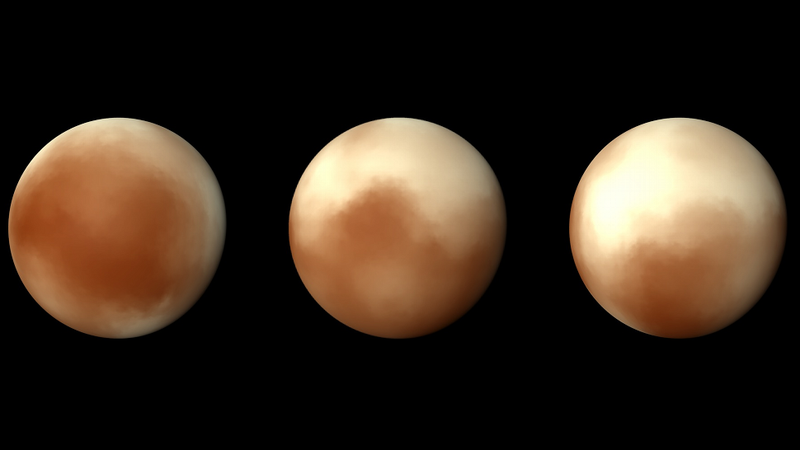 Normally, SER is used to generate photorealistic images of planets outside our solar system, including the ones for the Visible Paleo-Earth and the Habitable Exoplanets Catalog. The software was developed to simulate complex stellar transit events and interpret planetary light curves. The more data that the astronomers can plug into SER, the better the images — but it takes remarkably little information to create even the most rudimentary visualizations. Méndez, who works out of the Planetary Habitability Lab at the University of Puerto Rico at Arecibo, created the new images by analyzing albedo maps taken in 2010 by the Hubble Space Telescope. "We will keep generating better and better representations as we get more data from Pluto, specially from New Horizons," writes Méndez. "We also plan to produce more creative versions by adding more surface features. It will be fun to compare our progress, starting from our first image, until the final close-up pictures of Pluto on July 2015."